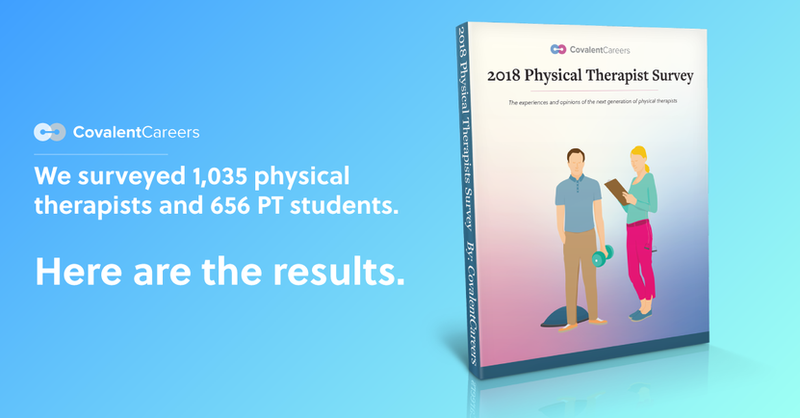 In 2017, we surveyed 1,691 physical therapists and students to get answers to the questions we were most curious about. We hope that these 26 charts and graphs help you better understand this wonderful profession of physical therapy! There was one clear winner here. The distribution of the other settings might surprise you. It is NOT compensation. That was shocking to us! Find out how much the average PT makes, and what the sentiment is like towards feeling capable of paying off student loans. Learn about what each demographic thinks about starting a business or practice, real life challenges, and feelings about the profession. Our physical therapy student and physical therapist survey uncovered some amazing stuff! This student and physical therapist survey focused on all kinds of things, from preferred practice settings, most important things in a job, to finances, to feelings about the profession. Let's take a deeper look at some of the questions and insights this physical therapy student and physical therapist survey uncovered. Upon graduation, in what physical therapy setting would students prefer to practice? In what settings do physical therapists currently practice? What is the second most popular and sought out practice setting for PTs? How likely are students to pursue a residency program? What are students’ top considerations for a job coming out of PT school? What settings do PTs want for their new job? What is the primary reason PTs are planning to change jobs? Do current PTs have any interest in a non-clinical career? The number of students likely to pursue a residency program was pretty flat. That leaves us wondering why? Aren't there distinct advantages of a physical therapy residency? When it comes to changing jobs, the primary reason PTs plan to change jobs is because they’re moving to a new location. Over a quarter of PTs are changing jobs because they’re seeking advancement opportunities or increased compensation—but they don't intend to do so by opening their own practices. This leads us to ask - "Why don't PTs want to be practice owners?" Interestingly enough, many physical therapists are interested in non-clinical careers. It’s no accident that one of the most popular articles on NewGreadPhysicalTherapy is about non-clinical opportunities for PTs. Are PTs more interested in careers outside of patient care? Is this why physical therapists don't appear to be overly interested in opening up their own practices? We do some more digging in the survey! When it comes to new jobs, the NUMBER 1 most important consideration for new physical therapists entering the workforce was not setting, nor was it income or benefits! Money and finances are always a topic that generates interest and discussion. We had to probe this subject matter and understand what physical therapists expect to make, what they typically earn on average, and what that looks like in regards to a return on investment in education! As a current PT, what was your starting salary? How confident are students in their ability to pay off their student loans? The cost of education has skyrocketed in the last few decades: that's no secret. It stands to reason that PT students would be concerned about paying off their student loans; however, a large majority of physical therapy students felt confident in their ability to pay off their student loans. Based on our survey data, it appears that new graduate physical therapists will be well-educated on average starting salaries in their fields and regions, and will come to the table ready to negotiate for what they’re worth! How do PTs feel graduate school prepared them in clinical skills? How do PTs feel graduate school prepared them for business ventures? What professional resources do PT students need, and what resources do current PTs want? Does your workplace offer a formalized (set mentorship hours, goal-setting, etc.) mentorship program? We weren’t surprised to find that most PTs think that their experience in graduate school prepared them pretty well when it came to clinical skills! How well does physical therapy school actually prepare you for practice? That's a different story . . . While some new graduate PTs might be interested in starting their own clinics or cash pay practices, PT school doesn’t appear to give them the tools and resources to learn how to do so. Perhaps we weren’t that astonished: after all, that’s why CovalentCareers has partnered with FOX Rehabilitation, which offers a formalized mentorship program to all new employees, complete with hours, goal-setting, and a slow ramp-up to full productivity requirements. Check out our FOX Rehabilitation resources page on CovalentCareers.com for more information! There are changes in the profession of physical therapy, just as there are changes in all of healthcare. We were curious to understand how students and practicing physical therapists felt about these changes, and subsequently how they felt about the profession and the future. If PTs had to do it all over again, would they still choose physical therapy? How do PTs feel about the future of PT? There was a good mix of optimism and concern reported in these results, but one thing is for sure: an overwhelming majority of respondents WOULD do physical therapy all over again!